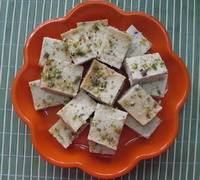 A Low Fat Paneer Barfi - An Indian Dessert Made From Cottage Cheese. 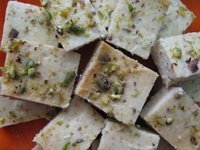 This Paneer barfi (cottage cheese dessert) is a low fat preparation as compared to the Indian milk based sweet called 'barfi', which is made from solidified full fat milk called 'khoya'. The latter is full of sugar and fat. But this one is a low fat paneer barfi. Hence, a healthy dessert forming an equilibrium between calories and taste. Try this easy baked barfi at home, you will love it. Boil the milk and slowly add the vinegar to it (a little at a time, add more if required). Lower the flame. Stir gently and when you see the milk has curdled and the water separated had turned almost clear pale green in color, it means your paneer is made. Put all this in a strainer and drain the water off. Wash under a tap to get rid of any vinegar flavor. Let it drain properly. In a food processor, put the bread slice or oats and turn it on for a few seconds, till the bread gets crumbled. To this add the paneer, condensed milk, cardamom and pistachio powder. Tip this mixture out on the greased baking tray, cover with a foil and bake in a preheated oven at 200°C for 30-40 minutes. After 30 minutes, carefully take the foil off and insert a skewer or knife inside this. If it doesn't come out clean then put it back for 5 minutes and check again. Once done, leave it to cool with the foil on. When cooled down, cut it into small squares of desired size. Eat it like that or refrigerate it and eat it cold. Can be served with some ice-cream but that will add more calories. So choose wisely.